The early stages of travel-retail growth were driven just by retailers’ and suppliers’ vision to exploit the novelty of airport retail. However, air travel is no longer considered to be expensive and there are frequent travelers. Hence, quite a number of retailers are considering the opportunity available at airports. Retail has always been about two primary things: consumer’s time devotion (the time they spend at the store) and the point of sale (the area, space, and format). Travel retail is unique as it best uses both these factors. 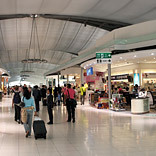 Travel or airport retail comprises of regular retail shops, duty free shops and food retail outlets. These are the three primary retail options one can look forward to and expect at airports. Travel retail in India is booming making airports the new retail destination in the country. Brands are expanding their footprint at key airports across India, thereby reaching out to the well heeled traveler, who is looking for premium products in potential retail environments. What lies in store is not only high number of footfalls but also getting the right consumer mix, including the high disposable income group besides, of course, the elite class. Another factor which encourages retailers to focus on airports is that there has been a major transformation in the look of airports which is “upmarket” and offers a great shopping environment. Travel retail is headed to explode and a lot of initiatives have and are being taken in this regard. A major development, which is set to act as a catalyst is the emergence of T3 – the state-of-the-art integrated terminal of Indira Gandhi International Airport (IGIA) in New Delhi. The terminal is expected to be the world’s third-largest in terms of size (after Dubai in the United Arab Emirates and Beijing in China). As a result, IGIA’s capacity would be increased to 60 million passengers annually (from 23 million) post the commencement of its commercial operation in July 2010. An interesting point to note here is that airports, retailers and suppliers take an initiative to interact and communicate with their target audience prior to embarking on a business venture at the airport. This is done online, wherein they tap those people who book their tickets online. The more the number of people book their tickets online, the greater lays the opportunity for retailers to communicate with them directly. It is thus understood that marketing begins way before the customer arrives at the shop. Travel Retail offers a tremendous opportunity to target customers from different nations, cultures, religions and ages – all looking to kill the spare time!